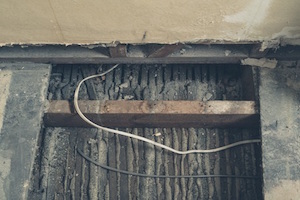 Antique architecture might be beautiful, but the electrical wiring in old houses doesn’t carry the same kind of charm. If you have an older home with an electrical system that hasn’t seen updates in a long time, you could be living in dangerous conditions without realizing it. There are warning signs that may indicate your wiring is too old, but if you’re ever in doubt, there’s a fool-proof way to get an assessment of your system: Call in a professional! An expert will perform an in-depth inspection of your home’s wiring so you can be aware of the situation and the solutions for it. How Can I Tell If My Wiring Is Too Old? Should I Worry about Electrical Wiring in Old Houses? Although old wiring can raise insurance premiums and keep you from using as many appliances as you’d like, the most important issue is safety. Over the course of time, the insulation surrounding the wires will break down until it eventually leaves the wiring exposed. The insulation protecting older wires doesn’t last as long as it does in newer installations. This means outdated electrical systems are much more likely to feature exposed wiring than those installed more recently. With inner wiring exposed, the likelihood of short circuits and power failures goes up. Worse, deteriorated insulation translates to a much higher risk of suffering from electrical shocks or having fires break out in your home. If you have any doubts about the wiring in your house, don’t take unnecessary risks. Ignoring the warning signs of an outdated electrical system can put you and your loved ones in danger. Beyond that, whatever money you might hope to save by not calling a professional would only go into repairs later on. A qualified electrical expert can give your home a thorough inspection and help you to figure out if you need to update your existing wiring. It will give you tremendous peace of mind to know you have the experts handling the situation for you. For more information on the potential dangers of electrical wiring in old houses, or to schedule an appointment, call Bryan Electric at (770) 680-2144 today.